The Black Sea is the largest meromictic basin, in the bottom sediments of which a powerful biogenic process of sulfide production occurs. The goal of the present work was to obtain data on phylogenetic diversity of the sulfur cycle microorganisms (sulfate-reducing and sulfur-oxidizing bacteria) in the Black Sea coastal gas-saturated bottom sediments. The samples were collected in the Chersonesus (Blue) Bay near Sevastopol from whitish bacterial mats of sulfurettes, and from the upper layer of the nearby seabed. Using DNA isolated from the native samples and obtained enrichment cultures, PCR analysis was performed with oligonucleotide primers specific to the fragments of the 16S rRNA genes of the main subgroups of sulfatereducing bacteria (SRB) and to the fragments of the dsrB gene (both reductive and oxidative types), encoding the β-subunit of dissimilatory (bi)sulfite reductase, the key enzyme in the sulfur cycle, inherent in both sulfate- reducing and sulfur-oxidizing microorganisms. The presence of 16S rRNA gene fragments specific to the genera Desulfobacterium, Desulfobacter, Desulfococcus–Desulfonema–Desulfosarcina, and Desulfovibrio–Desulfomicrobium was detected in the DNA samples isolated from coastal bottom bacterial mats. Usage of denaturing gradient gel electrophoresis (DGGE) with subsequent sequencing of reamplified dsrB gene fragments revealed that according to deduced amino acid sequences encoded by the dsrB gene (reductive type), SRB from the coastal gas-saturated bottom sediments of the Black Sea had the highest homology (92−99%) with the dsrB gene of cultured SRB belonging to the genera Desulfovibrio, Desulfatitalea, Desulfobacter, and Desulfobacterium, as well as with uncultured SRB strains from various marine habitats, such as bottom sediments of the Northern and Japanese seas. Deduced amino acid sequences encoded by the oxidative dsrB gene had the highest homology (90−99%) with the relevant sequences of the genera Thiocapsa, Thiobaca, Thioflavicoccus, and Thiorhodococcus. Original Russian Text © A.L. Bryukhanov, M.A. Vlasova, T.V. 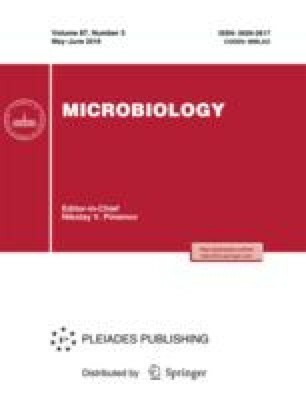 Malakhova, A.A. Perevalova, N.V. Pimenov, 2018, published in Mikrobiologiya, 2018, Vol. 87, No. 3.